The Mediterranean Sea. 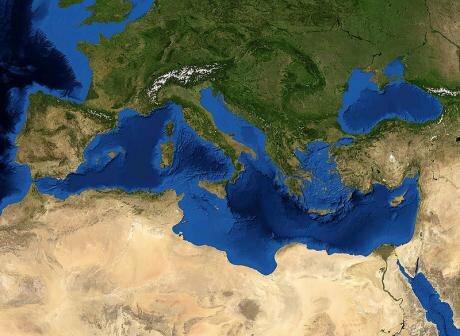 Screenshot from NASA World WindThis week, it emerged that the UK will not contribute to search and rescue operations in the Mediterranean, where more than 3,000 people have died so far this year as they seek European shores. The idea, apparently, is to deter others from embarking on the journey – a proposition as absurd as removing seatbelts in cars to make drivers more risk-averse. “Drown an immigrant to save an immigrant” is now the UK policy, as The Telegraph’s Dan Hodges pithily put it. Maritime “migration management” now reeks with the politics of death. Spool back to a year ago, when the mass drownings outside the Italian island of Lampedusa held out the hope of a new European approach to migration controls. “Never again,” dignitaries promised as they paid their respects in front of the coffins. Italy promptly launched an impressive military sea rescue mission, Mare Nostrum, which has saved thousands in the past year. Amid conflicting reports on whether this Navy mission will be wound down, the EU border agency Frontex is now readying itself for the launch of a much smaller European patrolling operation at sea. This is the context in which the UK has refused to participate in any rescue efforts because of their supposed “pull” effect on refugees and migrants. More controls and less life-saving is yet again peddled as an answer to the “border crisis”. A seeming paradox defines Europe’s response to irregular migration. On the one hand, we hear about violence and distress at the borders; on the other, about humanitarianism and human rights. While Italy’s Navy has mounted difficult rescues over the past year, the Spanish government has added razor wire to the fences of its North African enclave of Melilla and allowed violent pushbacks into Morocco, which it is now seeking to legalise. While the European Commission calls for smoother asylum procedures, member states lock refugees up or keep them stranded indefinitely, as happens in Malta and Spain’s enclaves of Ceuta and Melilla. While the EU’s incoming home affairs commissioner, Dimitris Avramopolous, has proposed humanitarian visas, Italy’s EU presidency has launched a Europe-wide crackdown on undocumented migrants. Time and again, any liberal advances are cut short by new draconian measures, motivated by a callous quest for “deterrence” despite the lack of any substantial evidence for its efficacy. The UK decision to publicly desist from saving lives – a policy filched from Australia in a posturing exercise by a panicky government, as another commentator has noted – has at least allowed some moral outrage to seep back into our sordid migration politics. Echoing earlier calls by Amnesty International and Human Rights Watch, commentators have in the past days called for more humanitarian action and less callous disregard of human life at sea. Yet in the wake of this important debate, we might now also be able to probe further. If we do so, we will see that liberal and securitarian approaches are by now in fact deeply enmeshed within Europe’s flawed response to unauthorised border crossings, despite politicians’ statements to the contrary. It is worrying how humanitarian initiatives have increasingly accompanied draconian migration controls in recent years. At Melilla’s land perimeter, for instance, one migrant was beaten unconscious by guards earlier this month before being dragged back through the fence into Moroccan hands – in stark contrast with the care offered by Red Cross staff to any migrants fortunate enough to breach the barrier. Meanwhile, draconian deportations writ large have in the past decade been smoothed by spurious “aid” deals with African states ready to accept deportees, as well as by the participation of humanitarian organisations. In this double-faced border regime, liberal and humanitarian measures are used as a plaster covering the wounds – physical, mental or metaphorical – inflicted by Europe’s authorities and their African collaborators. Yet the starkest interaction between care and control can be seen at the external maritime borders and beyond. Humanitarianism, more than a plaster, here functions as a key legal, moral and political justification for interceptions. When spotting a boat on their advanced surveillance systems, Spanish border forces call their Moroccan or Algerian colleagues so that the latter can “rescue” the passengers by bringing them back to the coast, regardless of their wishes. Similarly, European-African patrols along West African coasts have for many years now pre-emptively rescued migrants and refugees before they have even made a clandestine crossing or put themselves at risk. As one border guard explained to me, you have to prevent them from leaving so as to avoid them putting themselves in danger – with little regard to the international legal obligation not to expel people into countries where they may face harm (non-refoulement). In Italy, meanwhile, the previous government tried to justify its Libyan pushbacks as rescue operations in the landmark “Hirsi case” of the European Court of Human Rights. Yet it failed to convince the court, in large part because of public assurances that the operations were in fact crackdowns on “illegal migration”, and so – the court said – fell within the ambit of European migration law, not least as regards prohibitions on collective expulsions. As one legal observer has noted, the potential remains for Europe to follow an exclusively “humanitarian” approach – as long as non-refoulement is adhered to – in diverting boats back to North Africa. With this in mind, the UK’s political posturing on life at sea is not only incredibly callous; it also inadvertently presages less room for legal maneuvre in future operations. Mare Nostrum, thankfully, has not engaged in “humanitarian” pushbacks. Yet the Navy’s evident good labours still need to be seen within a much larger border regime, as other researchers have argued. In fact, if hardline politicians were genuinely concerned with curbing deaths in the Mediterreanean, they should look at curbing repressive policies at the EU’s fenced-off external land borders, which have diverted migrants towards more dangerous sea routes and into the hands of Europe’s humanitarian apparatus. We cannot afford to be naive, however. A rescue regime is certainly miles away from the alternative of more neglect at sea. Clearer European regulations for maritime operations and a common asylum system, both in the works, are important steps forward given the far-right advances across the continent. And a limited amount of EU-level accountability for member states is better than none, though Brussels should certainly push for more. However, we also need to look at the larger picture – that is, at the deep enmeshment of liberal and securitarian approaches in which brutal controls on one front combines with good-hearted rescues on another. This disentangling is becoming an increasingly difficult task, not least thanks to Brussels. Uneasily poised between intransigent member states and its own more liberal inclinations, the European Commission bureaucracy has, as one recent study shows, contributed to framing migration as a threat. We see, time and again, how “border management” concerns are accompanied by human rights reassurances in an attempt to please all sides. For instance, the EU “mobility partnerships” signed with states such as Morocco do include liberal provisions on labour migration and migrant rights yet also promise even tougher migration controls within the signatory country – as well as the prospect of forced readmissions of third-country nationals, already a reality in Turkey. Countries such as Libya have also been encouraged to develop a functioning asylum system for years, since such a system would allow European border guards to expel people back there without falling foul of non-refoulement principles. Yet such “cooperation”, promoted by the UK and others as an alternative to sea rescues, is counterproductive in the extreme since it has turned migration into a bargaining chip for North African states keen on extracting “geographical rent” from their position vis-à-vis Europe. It has also fuelled xenophobia as migrants become fair game, as seen from Moroccan panics about a “black menace” to Libya’s chaos, where sub-Saharan Africans are now routinely picked off the streets by militias and put in (EU-supported) detention camps, often kept until they pay steep liberation fees. Such harassment produces a perfectly reasonable “incentive” for desperate sea journeys – while oblivious politicians claim that rescues not repression are the main problem. Europe’s two-faced border response has also created a worrying mechanism for controls to keep on growing indefinitely. As more surveillance, patrols and barriers push migrants towards riskier entry methods, new “dual-use” measures – at once aimed at rescuing and intercepting those in distress – keep being proposed, including more maritime surveillance through the expensive “Eurosur” system. In this way, an industry has grown up around migratory routes in which care and control functions alternately clash and merge with each other. As one migration advocate recently quipped to me, a “theology” of border control now holds sway across Europe. Its unspoken assumptions dictate what the problem is, which our options are for solving it, and importantly where we should look – that is, towards the common external border, whether with our liberal our nationalist glasses on. Understanding the humanitarian-policing nexus at play here is key to move beyond the current impasse, in which the only two options available are those of more “tough” and more “humanitarian” controls – both blindly taking the borders of Europe as their only reference point, oblivious to the man-made chaos beyond it and the mitigating measures that can be taken there. Among these, for instance, are orderly refugee resettlement and aid to the non-Western countries hosting the vast majority of the world’s refugees despite their scant resources. Another key measure is to reduce precisely what the UK and other states want to bolster – the flawed “collaboration” with “transit states”, which has far only increased the desperation among migrants and refugees marooned in a violent limbo at the edges of Europe, with no way out but the sea. This article draws on some material that originally appeared in Spanish in La doble política de fronteras (El País, 22 October).